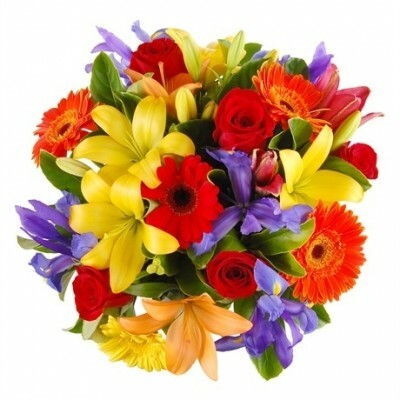 Malaga Flower Bouquet will bring perfect happiness to your special recipient in Spain. Manifest your appreciation across miles with this elegant combination of yellow lilies, 5 red roses, gerberas and blue iris (which may be substitute for Peruvian lilies). Gorgeous bouquet filled with positive energy and delight to give as a gift to someone in Spain. This bouquet features yellow lilies, 5 red roses, gerberas, blue iris (which may be substitute for Peruvian lilies) and greenery.